This plugin is 100% compatible with Divi’s Visual Builder as well as the standard backend builder. This plugin allows you to easily add date and time pickers to your website using Divi’s native Contact Form module. This license is for unlimited sites, lifetime updates. Set Hard minimum and maximum dates/times (specific dates) or Rolling dates that change automatically based around the current date. Only allow users to choose dates in the future (past dates are disabled). Custom date formatting to make the dates look nice. 12 or 24 hour time settings. customize the hour or minute increment to suit your own time block needs. Completely customize the date/time picker appearance to match your site’s theme or design. Set language per date/picker for multilingual sites. 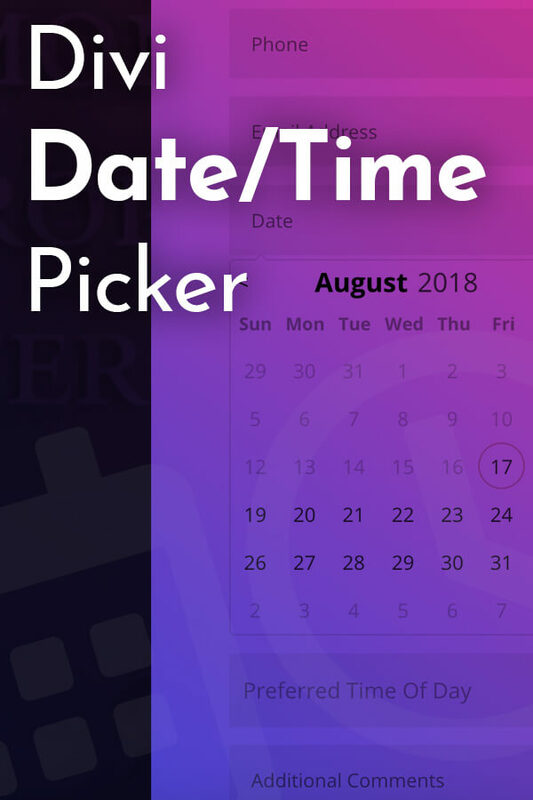 This plugin has around 50 language options included which you can set for each date/time picker you create. Perfect for multilingual sites. I want my products to be the best that they can be. Run into any trouble using my products or find a bug? Let me know about it on my support page! is there a possibility to block date for a scheduled appointment? So there won’t be 2 appointments at the same time. Hey Martin, at the moment if there are multiple datepickers on a page they operate independently so they don’t know what is in the other datepickers. It’s something I’m looking into for future releases but I appreciate the suggestion! Great plugin and top notch support. I had an issue with the calendarnot appearing and even though it was an issue my end nothing to do with the plugin Alex sorted it for me quickly, many thanks highly recommended. Thanks so much for the kind words, I appreciate it! Let me know if you need anything else at all! Great plug-in and even greater support! This plug-in saved A LOT of time and stress. With any coded plug-in there’s always going to be random issues or questions that arise, but Alex at Green Tree Media is quick to fix, answer, and accommodate. I have no hesitate recommending this to anyone who needs it. Hey Mike, thanks so much for the kind words and the support of the plugin! Let me know if you ever need anything at all! It looks like you’re setting a min time of 10PM and a max time of 3am which it can’t do because time ends at midnight (2400) on each day. What is it you’re trying to get it to do? Only allow people to choose a time between 10pm on one day and 3am on the following day? Fixed issue with certain special characters not displaying properly. Added _disableweekends option to (wait for it...) disable weekends in the calendar. The starting day of the week in the calendar is now based off the "start of the week" settings in the Wordpress settings. Improved compatibility for mobile devices. Integrated EMP's auto-update feature for purchases from the Elegant Marketplace. Updated some of the translation files.